KB8321NFL Features: -Designed for lifetime performance. -Fine artistic craftsmanship. -0.25'' Turn washerless cartridge. -Easy installation. -Finish: Polished chrome. -NuWave collection. Spray Pattern: -Vertical. Mount: -Widespread faucet. Finish: -Polished Chrome. Style: -Traditional/Modern. Commercial Use: -Yes. Handle Included: -Yes. Holes Required: -5. Number of Handles: -3. Handle Type: -Lever. Dimensions: Overall Product Weight: -5.99 lbs. Overall Height - Top to Bottom: -10.75". Overall Width - Side to Side: -14". 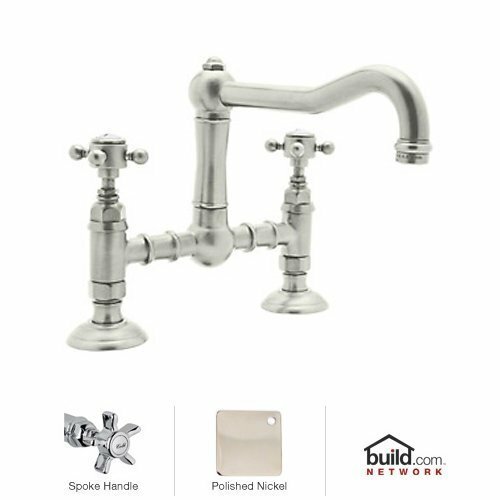 120191 Finish: Brushed Nickel Features: -Roman tub faucet. -Dependable ceramic disc technology. -0.25'' Turn handles. -8'' to 16'' Centers. 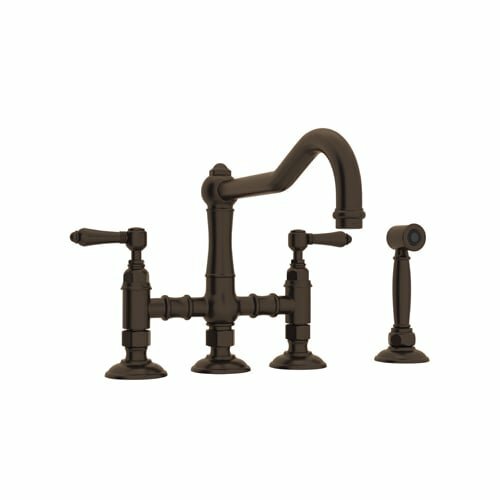 Product Type: -Roman Tub Faucet. Style: -Traditional. Finish: -Brushed Nickel. Finish: -Chrome. Faucet Material: -Metal. Number of Items Included: -1. 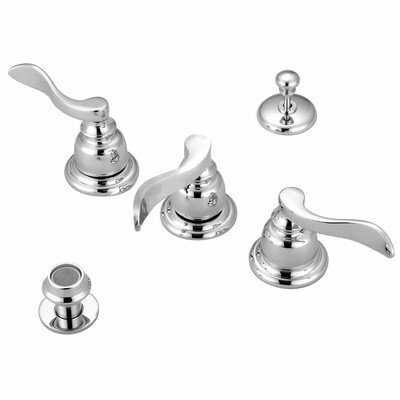 Generic Dimensions: -Dimensions: 5.25'' H x 9.13'' W x 30'' D. Dimensions: Overall Faucet Height: -5.25 Inches. Faucet Spread Minimum: -9.125 Inches. Faucet Spread Maximum: -9.125 Inches. Spout Reach: -30 Inches. Overall Product Weight: -8.365 Pounds. KB3492BL Finish: Polished Brass Features: -Faucet. -Lever handle material: Metal. -0.25'' Turn washerless cartridge. -90 Degree rotation water control mechanism. -2 Hole centerset installation. -Maximum water flow rate: 1.8 GPM/6.8 LPM at 60 PSI. Product Type: -Bar faucets. Number of Installation Holes: -2. Dimensions: -J-spout height: 10". -Overall dimensions: 10" H x 6.38" W x 3.75" D, 5.14 lbs. Overall Faucet Width: -6.38". Overall Faucet Height: -10". Spout Reach: -3.75". Spout Height: -10". Maximum Faucet Centers: -4". Overall Product Weight: -5.14 lbs. 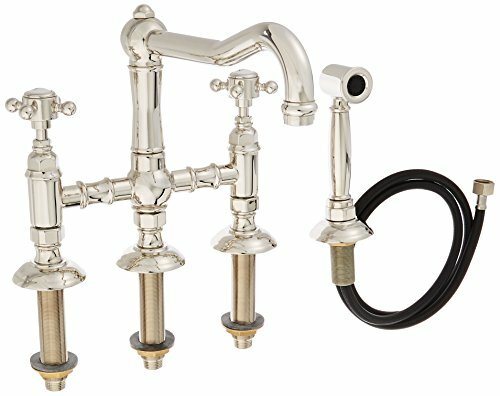 A1458XMWSPN-2 Finish: Polished Nickel Features: -Three leg bridge faucet with cross handles sidespray.-0.25'' Turn ceramic valves.-Swivel spout reach: 8.859''.-0.5''Male supplies.-Max depth of deck: 2.125''. Dimensions: -Spout height: 9.843''.-Overall dimensions: 9.25'' H x 8.859'' D. Collection: -Country Kitchen collection. Warranty: -Manufacturer provides limited lifetime warranty and no warranty on tuscan brass finish. 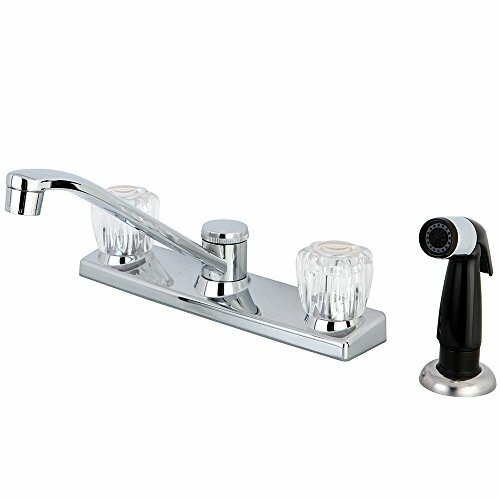 A1459XPN-2 Finish: Polished Nickel Features: -Deck mounted bridge faucet. -Swivel spout. -M supplies. -Country Kitchen collection. Product Type: -Bridge faucets. Number of Installation Holes: -2. Dimensions: -0.25'' Turn ceramic valves. Overall Faucet Width: -10.72". Overall Faucet Height: -9.53". Overall Faucet Depth: -10.22". Spout Reach: -8.86". Spout Height: -6.66". Maximum Faucet Centers: -8". A1458LMWSTCB-2 Finish: Tuscan Brass Features: -Country Kitchen collection. -Swivel spout. Product Type: -Bridge faucets. Number of Installation Holes: -4. Material: -Brass. Dimensions: -0.25'' Turn ceramic valves. Overall Faucet Width: -10.72". 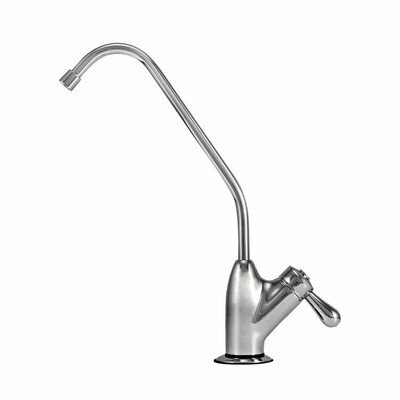 Overall Faucet Height: -9.25". Overall Faucet Depth: -10.22". Spout Reach: -8.859375". Spout Height: -6.625". Maximum Faucet Centers: -8". 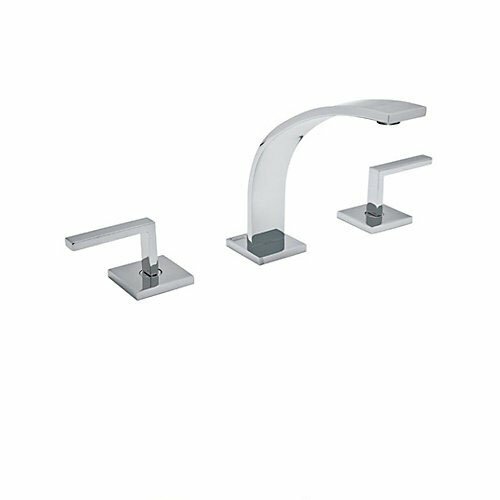 116125 Finish: Chrome Features: -Auxillary non air gap faucet.-Ceramic valve for long-lasting use and quality.-NSF certified.-Minimum hole in counter-top: 0.625''.-Tube connection: 0.25''. Dimensions: -Overall dimensions: 10.25'' H x 2'' W x 4.25'' D.
WA102L-APC-2 Features: -Wave three hole deck mounted widespread bathroom faucet. -0.25'' Turn ceramic disc valves. -Fixed spout. -Metal Lever handles only. -Ceramic disc valves. -Pop-up drain. Product Type: -Standard bathroom faucet. Finish: -Chrome. Dimensions: -3 x 1.375'' Hole cutouts. -1.25'' Pipe. Overall Faucet Height: -6.38". Overall Faucet Width: -11.5". Overall Faucet Depth: -6.88". Maximum Faucet Centers: -11.5". Minimum Faucet Centers: -5.88". Spout Height: -6.38". Spout Reach: -6.88". 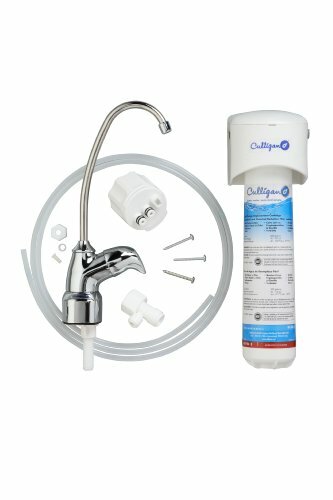 Compare prices on 0.25' Faucet at Shopsimal.com – use promo codes and coupons for best offers and deals. We work hard to get you amazing deals and collect all avail hot offers online and represent it in one place for the customers. Now our visitors can leverage benefits of big brands and heavy discounts available for that day and for famous brands.